Your reputation as a master Zombie Hunter and Zombie Whisperer precedes you, and you’re almost totally used to the fact that pictures of your lunch get ten thousand Instagram likes apiece. 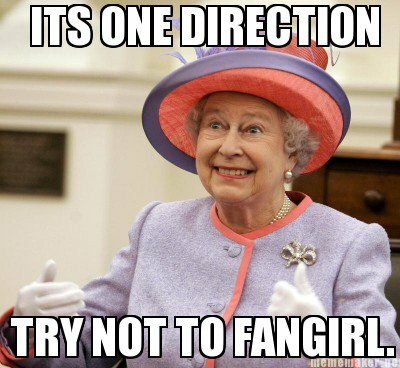 As it stands, your levels of fame, fortune and hysteria are paralleled only by One Direction. (Feeling confused right now? Check out this post). You’re sitting at home about to register a new gTLD (zombiesurvival.expert has a nice ring to it), when you hear a sudden noise behind you. ‘It can’t be anything of significance,’ you think as you turn around. ‘There was no thunder, lightning or appropriate dramatic music’. Subduing your instinct to run away, you take a deep breath, throw the door open and come face to face with…the postman. You immediately think that the Royal Mail should really provide private healthcare for their staff; you don’t want to cry ebola but that cough did not sound healthy. You tell the postman so, and he grumpily mutters something inaudible before shoving a parcel at you and shuffling back down the path. Shutting the door, you open the parcel excitedly. Yay! Your brand new smartphone has arrived. 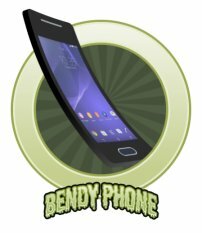 Funnily enough, it looks exactly the same as your current phone except cleaner, shinier, and…bendier? It’s been pre-bent to save you time and hassle. You’re a bit dubious, but since your Premium US Technology Company Named After A Fruit motto is ‘If they make it, I will buy it’, you shrug and admire its shininess. As you’re checking out the different selfie options, you hear a despondent beep that sounds vaguely familiar. The Kitten GPS tracker (navigation and zombie tracking in one adorable device!) strongly disapproves of any technology that isn’t her, but somehow this is different to her usual unimpressed response to anything new. Turning, you see that she has been enveloped in an odd white mist, and before you can respond she starts to judder and mew in a frightened kind of way. You have absolutely no idea what to do – turning it off and on again doesn’t seem like it would help – but it’s too late. Kitten GPS tracker is evolving! It’s adorable, but don’t call it cute if you want to keep your eyes. “Oh great,” you think. “At the very least she could have evolved into a Mewtwo”. And wait, hang on a second. How come you had to remortgage your house to afford a new Bendy Phone, yet your Kitten GPS was upgraded for free? Ugh, first world technology problems. Almost immediately, she coughs up a furball and some disgusting green slime with what appears to be a small piece of card. “All this technology and yet I’m getting messages via paper and cat zombie vomit now?” you think, grudgingly picking the note up by the very edges and unfolding it in disgust. 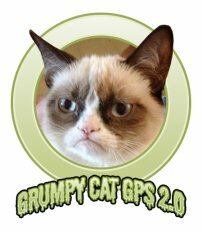 It seems like Grumpy Cat GPS’s grumpiness is contagious. By now you're used to these kind of unconventional zombie-themed cries for help. “Straightforward enough”, you think, and start collecting together your zombie hunting gear. As you’re pulling your Evil Corporation umbrella out of the cupboard, you accidentally dislodge a box on the shelf above your head, and it narrowly misses hitting you. You acquired Cards Against Humanity! 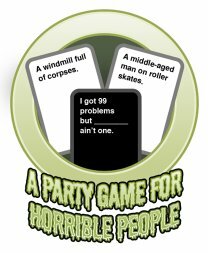 It’s not normally something you’d take on a zombie hunt, but you could do with some light entertainment. Wait a second. You hurriedly compare Grumpy Cat’s slimy playing card to your Cards Against Humanity set. It’s definitely a custom card from the game. You instantly feel cheerful. Whoever you’re rescuing, they’ve clearly got a good sense of humour and will probably be up for a game after all this is over. You sling your rucksack over your shoulder, grab Grumpy Cat and head out towards the caves. The journey is uneventful and it’s not long before you reach your destination. The caves loom ahead, dark and imposing. Shivering, you launch the torch app on your Bendy Phone and take a deep breath. They’re known locally for being a maze of underground tunnels and dead ends, and you could be wandering around helplessly for hours. You have no idea where to start and Grumpy Cat is deliberately silent and unhelpful. What now? Enter your name and email address below for your chance to win a three month subscription to My Geek Box, a trick-or-treat goody hamper from Sweet Memory Lane, and £100 Heart Internet credit! Can you do a hard refresh please and see if that helps? If not, please let me know what device, browser & OS you’re using and we’ll investigate.